The first cities did not arise suddenly as if nomads one day decided to band together and the next thing they knew they were hunting and gathering chicken thighs wrapped in Styrofoam and cellophane. 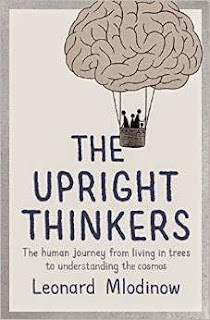 It's interesting to compare this book with Steven Weinberg's To Explain the World, which has related aims, though it lacks the first part about the development of humans. Without doubt Mlodinow's book is by far the more readable. And Weinberg has been slated in some sources for being unforgiving of the lack of modern insights in the likes of Aristotle, where arguably they should be allowed to be people of their time. But for me, Weinberg delivers a more challenging and stimulating read. Even so, Mlodinow's book is certainly more of a natural read for a popular science audience. The Upright Thinkers is divided into three sections, and for me the beginning and end work far better than the middle. As an author, I can see the sense behind the low point being the middle section, but the worry might be that some could give up part way through. The first part shone brightest for me. This is the most original section, with really interesting consideration of the very early development of maths and culture. Despite that intrusive Styrofoam, I challenge anyone not to find this section genuinely fascinating. In the middle we plod rather heavy handedly through the likes of Galileo and Newton. Then things liven up with quantum theory (oddly there is very little about understanding the cosmos per se). There isn't a huge opportunity to gain insights into quantum physics itself, but there is plenty of context and a good feel for the way that modern science has moved away from hands on science to the indirect and theoretical. Like Weinberg, one of Mlodinow's failings is not putting across the best understanding of history of science. He doesn't seem to realise, for instance, that Newton's 'If I have seen further' comment in a letter to Robert Hooke was not supposed to be a compliment. And, yes, there's the hackneyed old claim that Giordano Bruno was burned at the stake for the heresy of declaring 'that the earth revolved around the sun.' (He wasn't, it was common or garden religious heresy.) And, for that matter, the family of Gilbert Lewis will be surprised to discover that Max Born introduced the term 'photon'. Overall then, a solid overview with some interesting novelties on early civilisation, but probably more a book for those who don't generally read popular science than those who do - and that's not a bad thing.